Serpa Collision Centre > Uncategorized > News > Managers Winter Tire special! 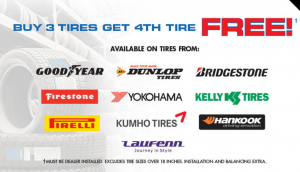 Plus Three for Four tire special offer! Managers Winter Tire special! Plus Three for Four tire special offer! Winter’s getting very close and now is the time to take those extra precautions that will keep your vehicle safe and sound in the cold weather ahead. When the mercury dips below 7°C, even all-season tires become less effective. Winter tires, with their unique compounds, treads and biting edges, are designed to reduce stopping distance up to 25% — a difference you’ll really appreciate during sudden braking.Those who install them also often receive insurance discounts. Serpa Chrysler Dodge Jeep RAM has two special offers we recommend strongly. Call our parts and service department at 416-450-5555 for more information! Stop on average 6 ft. (1.8m) shorter on snow than a leading competitor. The second special promotion, for all other vehicles with tires no more than 18 inches, is the Serpa Dodge Jeep RAM three-for-four sale. It’s very straightforward. 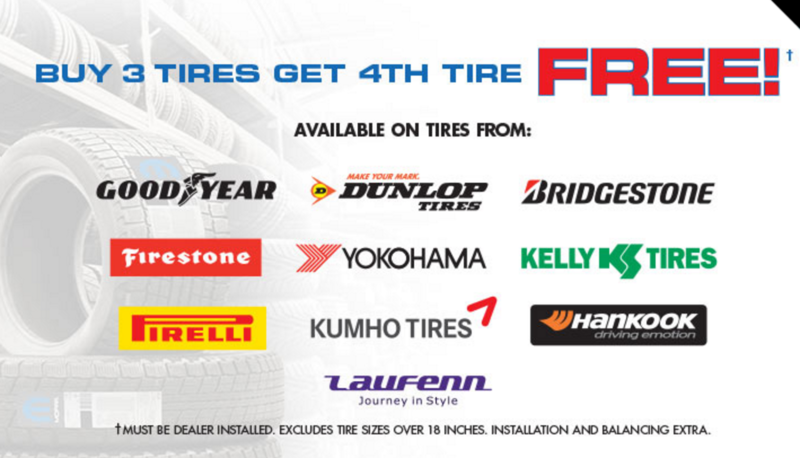 Buy three winter tires from the many major brands listed below, and the fourth one is yours at no additional charge. We need to be the ones installing them (which is extra) but we think you’d want that anyway. The brands include Goodyear, Firestone, Dunlop, Hankook and many more.